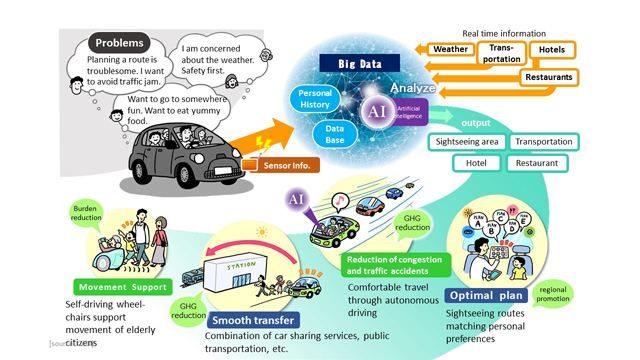 In Society 5.0, new value can be generated in the following ways through AI analysis of big data in a database spanning diverse types of information including sensor data from automobiles, real-time information on the weather, traffic, accommodations, and food and drink, and personal history, and the following will be realized. ・Make movement smooth by combining car sharing services, public transportation, etc. Furthermore, for society on the whole, these solutions will help reduce CO2 emissions by public transportation institutions while promoting regional revitalization and stimulating consumption.